Woah, where did all the people come from this weekend!! So many at Thundercross. 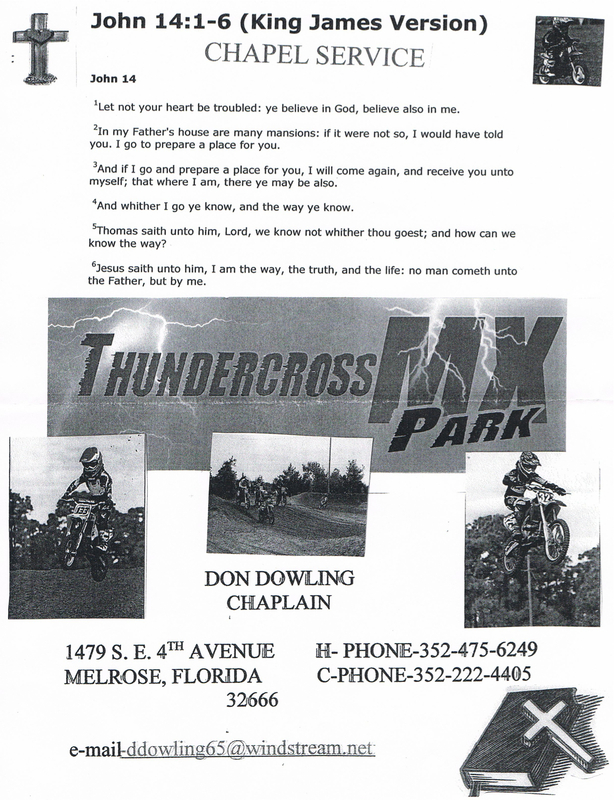 Glad to see that South Florida Motocross is alive and well. You all had me worried there for a bit. I believe that both the 450 bikes and the 250 bikes had to be split up (each) due to so many riders Sunday morning at practice before the races began. Very cool to see Adam Cianciarulo and Zack Freeberg tearing it up again on the track, as they did last week at Bithlo! Sunday started off with a Church Service at 7:30 by Chaplain Don Dowling. Below is a hand out from the service. So if you missed it, well here you go! Click on the image to see a larger view. DZP pictures are for sale ya know. You can order prints of any picture you like. The pictures uploaded to the website are highly compressed and do not represent the quality you will get with a printed version. Click below for the link to order picture prints. REMEMBER DZP WILL NOT BE AT THE LAST RACE OF THE SERIES (THUNDERCROSS). I MAY HAVE A REPLACEMENT HOWEVER, STAY TUNED!